Baritone Ukulele (maker unknown), c. 1960's, probably Japan, serial # 2311 JA, natural lacquer finish, mahogany body and neck. Overall length is 29 in. (73.7 cm. ), 9 3/4 in. (24.8 cm.) wide at lower bout, and 3 in. (7.6 cm.) in depth at side, taken at the end block. Scale length is 19 1/2 in. (495 mm.). Width of nut is 1 1/2 in. (38 mm.). This is an attractive-looking, fairly good quality Asian-made Baritone Ukulele from the 1960s with a nice look and surprisingly good sound. The finish has some scuffs and scratches and a lot of checking, and there is one repaired top crack behind the bridge. 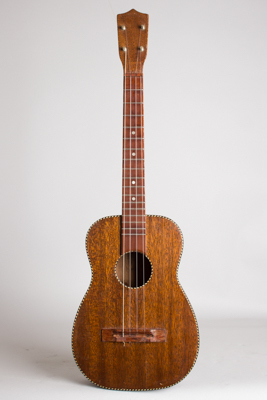 The neck is not perfectly straight (it is quite slim, actually), but the instrument plays as well as most old baritone ukes; a decent vintage player or knock-around uke. Overall Excellent - Condition.